Get a major head start on a career in the photo industry. With panel discussions, equipment demonstrations from industry experts, and hands-on training, attendees will come away with the essential knowledge and confidence to build your own Pro Assistant reputation. Acquire a comprehensive understanding of professional assisting behavioral guidelines, including contemporary set-etiquette, and discover how this valuable training will get you more call-backs – more repeat clients, more work. Kicks off with the popular “Assistant Panel” which includes experts on working as a photo assistant. Get real world answers to all questions from the attendees. Following the panel discussion will be exciting live software and equipment demonstrations with industry reps from Sony, Profoto, and Adobe. Learn from the pros. Industry reps will be on hand to answer all your questions. Day One location on the RIT campus is in Chester A. Carlson Auditorium, Center for Imaging Science (Building 76, Room 1125). Parking in lots E and F.
How should an aspiring assistant approach a photographer? How did you get your first assistant job? How do I find photographers to work for? What rate should an assistant charge? What is the difference between a tech and an assistant? How long should I wait to get paid? Who besides a photographer should I contact to get assisting work? What do you look for in a photographer you work for? What should an assistant bring to a shoot? What questions should an assistant ask when called for a job? What do you say if asked if you are a photographer too? What do you do if you have to make a call? Cell phones on set? What non-photo skills should I have? Social Media, blogging, self promotion etc? What about mixing male/female assistants? How and should an assistant be picking up gear and equipment before & after shoot? How much of your own work do you shoot will being a busy assistant? When was the last time you used a new assistant? How did you find them? What do you look for in an assistant? Full on, hands-on workshops with much of the gear an assistant will most likely encounter on the majority of professional photo shoots. Many aspects of assisting will be explained in great detail, i.e. strobes, hot lights, flags, scrims, set etiquette, the assistant kit, tips on getting work, billing, and how to deal with the dreaded cancellation. 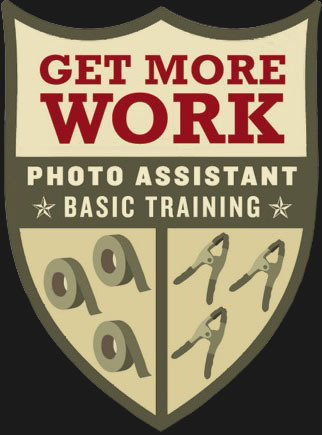 Following classroom discussion and demonstrations, participants will work along side the Pro Photographers to discover crucial pro assisting skills. Day Two location is in Frank E. Gannett Hall (Building 7B), 4th Floor Studios. Parking in lots E and F.
Master Assisting Professionalism. Get booked solid. Pulitzer Prize-winning photographer Brian Smith photographs portraits of Hollywood A-List and Fortune's 500 for magazines, corporations and advertising. He's a Sony Artisan of Imagery, Profoto Legend of Light, Adobe Influencer and X-Rite Master Coloratti. Thank you for supporting this website through purchases from our affiliate partners.